New 'Darkness' device gives astronomers a powerful tool for spotting worlds around other stars. An international team of physicists and astronomers has created what’s being billed as the world’s most advanced camera. Known as Darkness (for Dark-speckle Near-infrared Energy-resolved Superconducting Spectrophotometer), the suitcase-sized device is designed not for taking big panoramas or snapping selfies but for spotting planets around nearby stars — and enhancing the search for alien life. It’s proven hard for Earth-based observatories to detect exoplanets both because light from celestial objects becomes distorted as it passes through Earth's atmosphere and because the light that reaches us from exoplanets is extremely faint compared to that from their host stars. “It’s technically very challenging, because the star is at least a million times brighter than the planet,” said Benjamin Mazin, a physicist at the University of California, Santa Barbara, and the leader of the team that built the camera. That bright starlight tends to wash out the light from exoplanets. "It’s like trying to pick out a faint ember next to a brilliant searchlight from many miles away," said Ray Jayawardhana, a professor of physics and astronomy at York University in Toronto, Canada, who is not involved with the Darkness project. Darkness gets around both problems by filtering out the light from individual stars and compensating for atmospheric distortion via a special mirror that changes shape thousands of times a second to correct the troublesome atmospheric “blurring." “It’s pretty impressive technology,” said Bruce Macintosh, a Stanford physicist who isn’t involved with the Darkness project. “What’s powerful about directly detecting these planets is that we can measure their light and see the composition” of their atmospheres. Given the challenges of detecting exoplanets with ground-based observatories, the search for exoplanets has relied mostly on space-based observatories like the Kepler Space Telescope and the newly launched Transiting Exoplanet Survey Satellite (TESS). These satellites detect exoplanets by scanning the cosmos for transits, which are periodic dips in a star’s light that occur when a planet passes in front of it. But while the transit method has proven to be very effective at spotting exoplanets, it's of little value in determining the composition of exoplanet atmospheres. The light from an exoplanet can help astronomers determine whether its atmosphere contains hydrogen, methane or other chemicals that suggest the planet might be able to sustain life — or actually harbor it. In addition to helping astronomers see exoplanets, Darkness “offers the prospect of revealing whole new exoplanet populations that are normally beyond the reach of other detection techniques,” Jayawardhana said. Darkness was built for the Hale telescope at the Palomar Observatory near San Diego. Mazin said the camera is capable of detecting Jupiter-sized exoplanets, and he added that as the team hones the technology, the camera may eventually be able to spot alien planets as small as Earth. 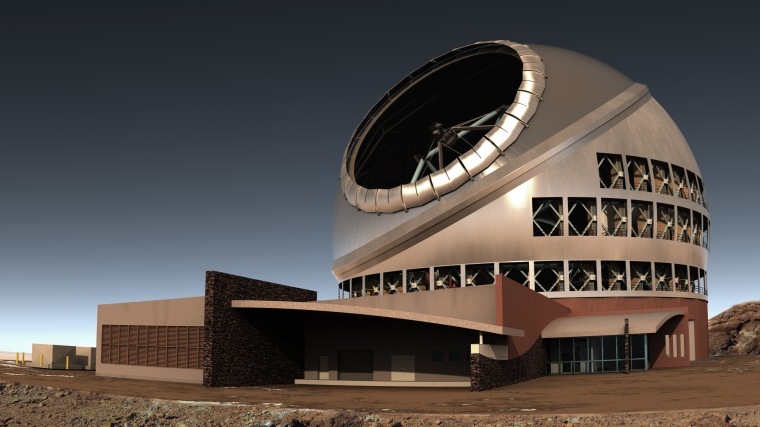 The team’s ultimate goal is to build an upgraded version of Darkness for the Thirty Meter Telescope, a huge observatory to be built atop Mauna Kea, a dormant volcano on the island of Hawaii. The $1.4-billion observatory is expected to begin operation in 2027.